I am the postie today (if you call it that) as Steve has the man flu. 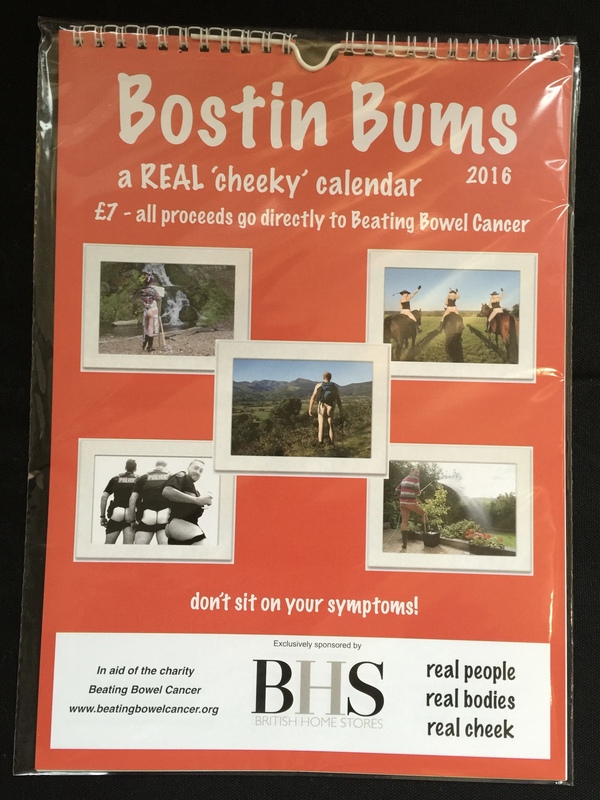 On the Saturday Steve headed to the Isle of Wight’s BHS with the Beating Bowel Cancer calendars. They made Steve feel very welcome and managed to sell loads in raising money for the charity. While this was going on our family friend Nicky Jones came over to help my nan with the patient haha (I was in London). Thankyou very much Nicky it was really appreciated! So the update on my mum (Wendy), she is still recovering from the chest infection and has been taking the amoxycillin to help this. Today she has started to drink a protein drink called Ensure Plus chocolate and strawberry flavours yum yum! It’s great that she likes them and we can finally see her getting the needed vitamins. At the moment she just needs to relax and rest as much as she can so she can fight the chest infection. The nurses are due tomorrow to do the blood tests and a general health check. Last night, a reader of the blog a lady named Sue dropped by our house to deliver some food for my mum which was really generous of her, so thankyou Sue very thoughtful of you! Also, a BIG BIG BIG THANKYOU to everyone who has continued to read the blog. It’s lovely to know there are a lot of people supporting the family and my mum in their own ways. I know it’s been a bit slow recently but hopefully things will get back to normal and I’m sure mum can’t wait to start it up again! A big thankyou to those who have also brought our calenders, all the money given goes to raising money for Beating Bowel Cancer is amazing! We have raised £6,689.00 that is amazing!! It’s all down to your generousity and support! Poor Steve, Man Flu get well soon Mr Wonderful. Thank you Rebecca for the update. So glad the Isle of Wight trip went ahead even if Steve had to go alone. Looks like it was a success. A relief to hear some news and to know that Wendy’s on the mend. thanks for the update Rebecca we’ll take any info so thanks for finding time to post. sorry mr wonderful has been struck down by man flu must be that sea air. fantastic amount raised so far with the calendars. Hope wendy starts to feel better soon. Hi Rebecca thanks for the news on your mum lets hope the blood test come back all good and the protein drinks help build your mum up a bit. You must all be thrilled with the amount of money raised so far and yes alot of us have donated but this wouldn’t have happened without your family input and hard work, so well done one and all. Really kind of you to post an update Rebecca – thank you. can’t believe how much has been raised to date from the calendars. Wendy you should be so proud, It’s all come from your hard work and the sense of purpose that drives you, a big thank you to your lovely Steve, he has been and still is your rock. Hope that your feeling a lot better and well done. So nice of you to keep us informed Rebecca,don’t like to contact you direct.Hope Wendy manages to fight off her chest infection and avoids the “man flu”I expect you are all a bit worn out with everything going on but glad Steve Managed to deliver the Calendars so sorry Wendy had to miss the trip.Give her all my love from Ex ex ex Boss. Thanks for the update Rebecca. Great to see Steve at the weekend and I wish him a speedy recovery. Great photos of the IOW launch, lovely to be involved and a huge thank you to everyone who gave donations, bought pins and calendars. Love and best wishes to Wendy, hoping the antibiotics are starting to kick in and clear up the chest infection. thanks so much for the update Rebecca – your mum’s blogging skills have rubbed off on you!